The joint venture Russia-India company BrahMos Aerospace, which manufactures the BRAHMOS supersonic cruise missile, celebrated another anniversary with some new goals. These include equipping three other military regiments with the BRAHMOS, testing an aviation-compatible version of the BRAHMOS-A, and also developing smaller versions of the BRAHMOS-NG and hypersonic BRAHMOS-2. BrahMos Aerospace was founded in 1998, and named in honour of the Brahmaputra River in India and the Moscow River in Russia. "BRAHMOS has certainly made India proud to possess an advanced high technology weapon system, which no other country in the world has", said APJ Abdul Kalam, India's former president, speaking at an official ceremony. In the past year, a total of 62 missiles have been delivered to the army, navy and air force against the contracted - for delivery of 60 missiles, along with the delivery of ground systems to the first BRAHMOS Squadron of the Indian Air Force (IAF). Abdul Kalam said he was sure that BrahMos Aerospace would achieve new heights this year and, in June 2016, would begin to supply the aviation version, the BRAHMOS-A, to the IAF. Sudhir Kumar Mishra, Chief executive of BrahMos Aerospace, said testing of the BRAHMOS-A would take place onboard a Su-30MKU this year. "Will order three more regiments"
An RIR source close to the Ministry of Defence, said on condition of anonymity that Indian Armed Forces had earlier ordered a fourth regiment of BRAHMOS missiles. "By the end of the year we want to order another two - accordingly a fifth and sixth regiment", the source said. Each regiment is made up of four launching vehicles and 90 missiles and costs around 2000 crore rupees ($300 million). In April, the army decided to arm a third regiment with the BRAHMOS. So far, BrahMos has also successfully handed over three Technical Positions (TP) to the Indian Army and two TPs for the IAF in different locations in the Western, Central and Eastern sectors of India. "We have also given ourselves the task of creating smaller versions of the BRAHMOS / BRAHMOS-NG and, over the next 5-10 years, develop the hypersonic BRAHMOS /BRAHMOS-2/", Mishra said. 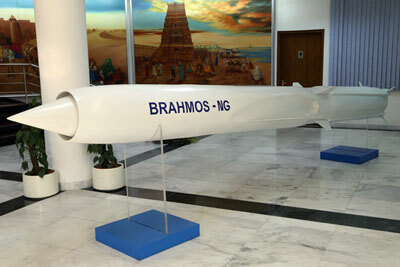 The BRAHMOS-2 is likely to achieve speeds greater than Mach 7, or seven times the speed of sound.